Built on the former site of a rural, historic schoolhouse, there was some concern from the community regarding the size and appearance of the new home. However, our clients were sympathetic, and everyone involved worked hard to ensure that the new building would blend seamlessly into its natural surroundings. 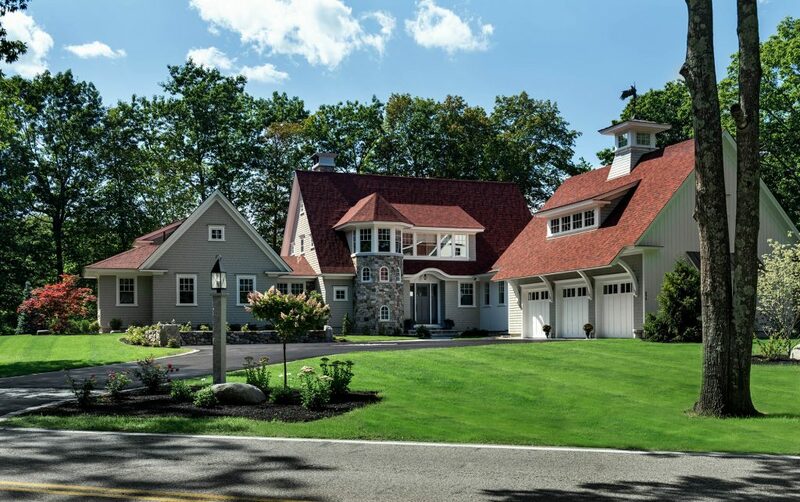 Gabel roof elements, natural stone exterior details, and white shingles all call back to classic, New England style. 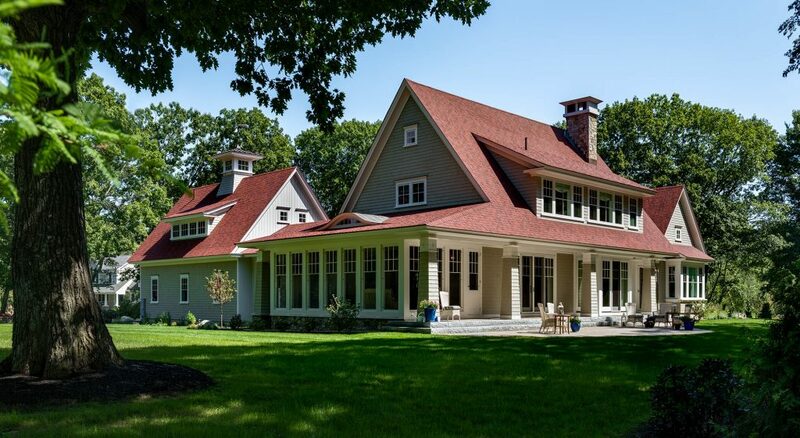 Multiple dormers and roof lines pop out of the simple gable roofs to create useable living space on the second floor, while projecting a reduced sense of scale by maintaining the illusion of a one story structure. A spacious sun room allows for year round views of this home’s beautiful, natural surroundings. Indoors, the TMS Interior Design team worked with the client every step of the way to create the comfortable, casual, and colorful space they envisioned. The main floor of this home is one open layout, with the living room, dining, and kitchen areas all integrated into one large space. The contemporary kitchen features luxurious amenities, yet natural colors and kitchen island seating give the space a more casual feel. 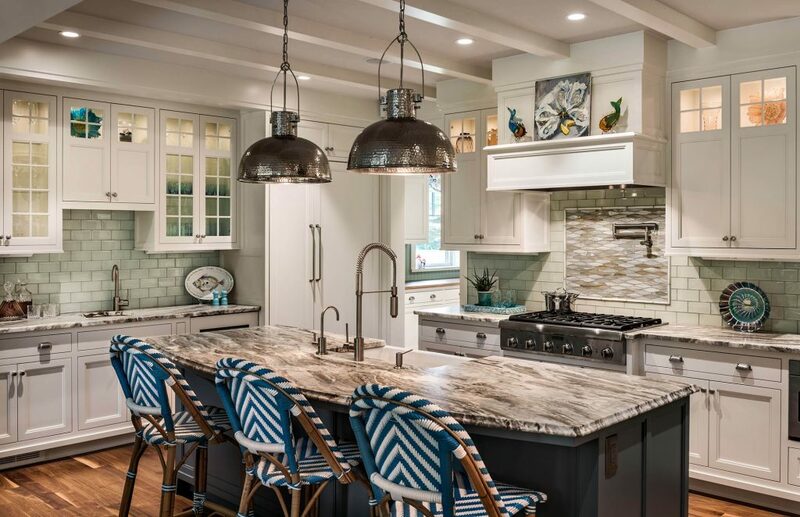 The traditional pierced metal Moroccan style lanterns hanging over the island create a fun focal point with transitional style. Even the formal dining room feels relaxed, with a melange of patterns, natural details, and soothing blues and greens. 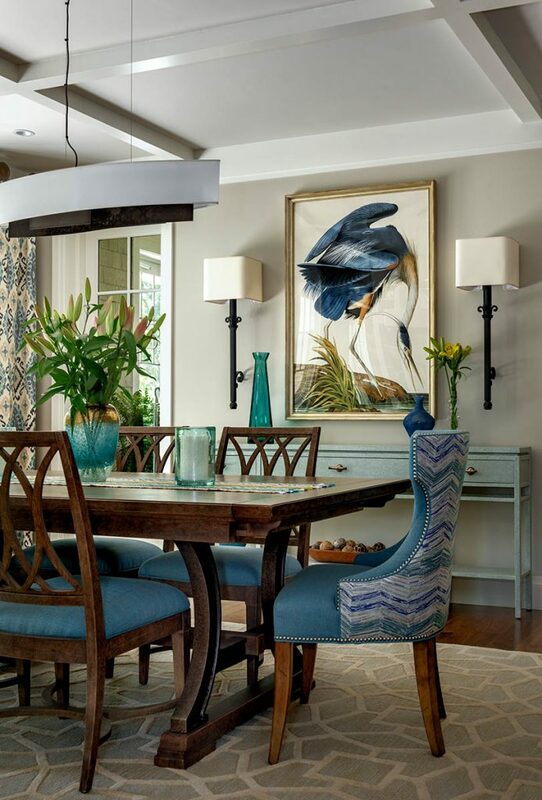 The homeowner loves birds, so the Blue Heron print was incorporated into the design early on to set the mood of the room. 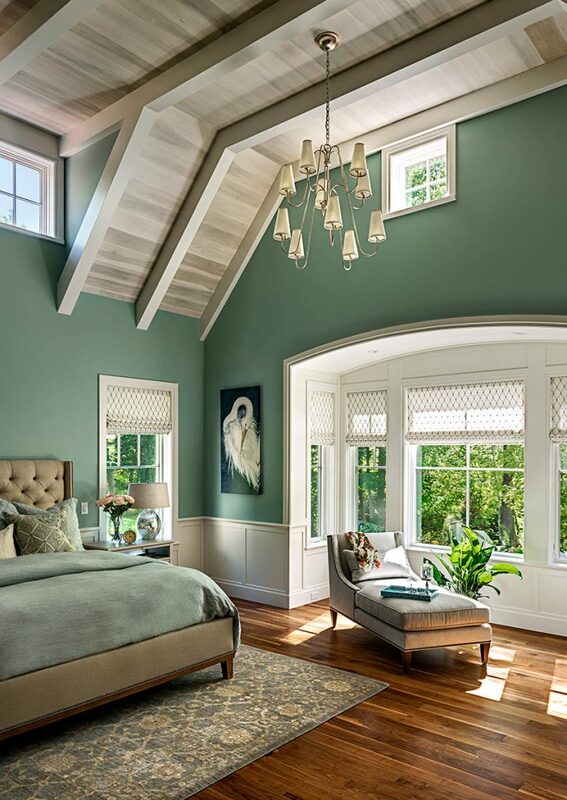 In the first-floor master bedroom, a cathedral ceiling gets a contemporary treatment. The home’s natural surroundings (as well as plenty of sunlight), pour in through the windows and are echoed in the interior’s color scheme. The result is a sun-soaked and soothing space to relax. Building on a historic, rural site can be a challenge, but our team is always up for the task. We were delighted to be able to create a space that perfectly captured our clients’ vision and paid homage to the surrounding site. Are you ready to bring your dream home to life? Contact us today to get started.